Learn skills to develop better connections with animals, both wild and tame. Since ancient times, humankind has understood that animals serve as a link to the intuitive and to the Divine. In todays hectic, fast-paced world, we have lost this important connection. Now, with What Animals Can Teach Us about Spirituality, you can rediscover it and tap into your spiritual nature in new ways. 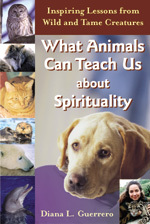 This useful and inspiring book will open up possibilities for more sacred living through the example of creatures of all types. Youll discover innovative approaches to understand animals, improve relationships, and connect to your center.